CAIRO – 29 January 2019: Egypt jumped from the 104th position in 2016 to 66th in the 2018 Environmental Performance Index (EPI) issued by the Yale Center for Environmental Law and Policy, Planning Minister Hala el Saeed said on Monday, January 28. 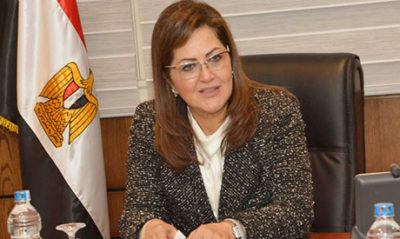 Egypt also ranks the 97th in the Sustainable Development Index measuring 156 states, the minister stated at a ceremony marking the 23rd anniversary of the National Environmental Day organized by the Arab Office for Youths and Environment. Moreover, Egypt climbs to the 24th position in the 2019 Climate Change Index, she added. She unveiled efforts to enhance the environment's role in achieving sustainable development and turn into green economy. On January 20, a ministerial committee formed of ministers of military production, local development, and environment besides the chairman of the Arab Organization for Industrialization, headed to Berlin to learn about the latest technologies used to set up waste recycling plants. The visit came within the framework of President Abdel Fatah al-Sisi's directives to carry out a strategy to implement an integrated system to eliminate waste issue, benefiting from the German expertise in this regard. The strategy includes developing plans to increase the efficiency of the waste recycling plants located in the governorates, to supply some plants with new lines and equipment with latest technology, by taking advantage of the German expertise applied in this field. During the visit, the ministerial committee learned about technologies used to set up waste recycling plants and ways to use recycling extraction in industry, agriculture, fuel production, and electricity generation. On one of the greatest initiatives to turn into a green economy, Sisi directed encouraging citizens to convert their cars to run with natural gas instead of petrol. Prime Minister Mostafa Madbouli affirmed the necessity of harnessing the available resources in the country, referring that this is important in reducing the state's subsidy bill and achieve environmental benefits, Madbouli said, directing increasing natural gas filling stations nationwide. Egypt has launched several initiatives to recycle wastes and to solve the garbage problem. The Cairo governorate launched a project called “sell your garbage”, aiming to establish kiosks in different neighborhoods where people are encouraged to sell their cans, plastic bottles, paper and cardboard instead of throwing them away in 2017. Moreover, In a bid to tackle this problem, several startups have emerged seeking not only to raise awareness about the environmental issues, but also to promote solutions to improve the environment and address the impact of climate change.